Thousands of simple, practical, kid-tested ideas to help you build character, avoid power struggles, increase school success, motivate cooperation, reduce conflict, solve problems and create safe, loving relationships with children of all ages! Adapts to your own needs, goals and values to minimize conflict and maximize cooperation in an environment of mutual love, respect and caring. 8 ways to deal with criticism about your parenting—and much, much more! Great ideas for all parents of children of all ages. A great resource for counseling centers, parent libraries, and classroom newsletters. —Barbara Coloroso, author, Kids are Worth It! Just glancing through a few pages of this book gave me a few ideas that could make my life a little easier. I think it is well worth the small price. What I liked about this book is that there is several pages of resources where you can contact authors, consultants, trainers, parent educators and publishers for additional infomation abou their programs, services, or resources. It includes addresses, phone & fax infomation (if they have a fax number)… Overall, I found this to be an excellent book to read. Effective with kids of all ages. 5” x 7 3/8,” 368 pages. HALF OFF. Sale price $9.50. New! This book is now available in Spanish. Click here for details about Listas Para Padres. 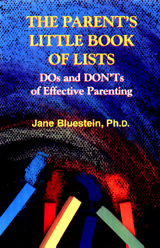 Use your credit card or PayPal account to order The Parent’s Little Book of Lists through a secure server online. Thousands of simple, kid-tested ideas to avoid power struggles, increase school success, motivate cooperation, solve problems, and create loving relationships with children of all ages! Half off retail price. Free Media Mail shipping on all prepaid U.S. orders. International visitors: 10% discount on all prepaid merchandise (excluding downloads). For more information, click here. Read excerpts and other materials by Dr. Bluestein in Spanish and French. ← Presentation: Perfectionism—What’s it Costing Our Kids?